The Briquet Griffon Vendéen is a scenthound that can hunt both large game and small game. They usually hunt alone, but can also be found in packs of four to six dogs. The Briquet Griffon Vendéen is a scenthound that originates from France. 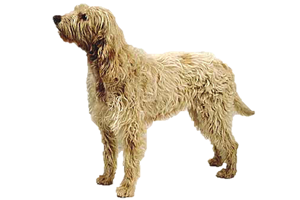 They are bred down from the Grand Griffon Vendéen and are related to the Grand and Petit Bassett Vendéens. They were created by the Comte d’Elva before WWI for the ability to be able to handle all game, unlike their close cousins who specialize in either large (Grand) or small (Bassets). Is the Briquet Griffon Vendéen Right for You?